Recorded between 1963 and 1976, these Cologne broadcasts generally sound quite good. More importantly, they capture Karl Bőhm in excellent form. 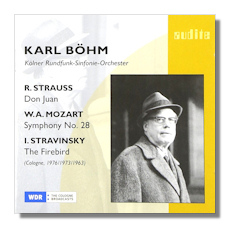 While the conductors' Berlin Philharmonic and Vienna Philharmonic Mozart recordings still command great respect, his studio Strauss recordings were – perhaps justifiably – overshadowed by those of Herbert von Karajan. As for the Stravinsky, there are no studio recordings in the Bőhm discography at all, though a video on YouTube shows the aged conductor demanding unusual accuracy from the Vienna Philharmonic in this very work. If I recall, it's Japanese subtitles for German speech, but despite this barrier (for me, at least) there is no question that the conductor understands the music and gets what he wants. The Strauss is wonderfully played and has some great brass playing and solo work. While not breaking any speed records, it feels wholly natural and Bőhm commands the idiom as well as anyone. The 1976 sound is easily the best on the disc, and this compares favorably with any of the other 80 or so Don Juan recordings I've reviewed for this site. The Mozart might strike some as old-fashioned to a fault. It's big-hearted and full of character. Bőhm didn't record this work outside of his complete Berlin symphony cycle, and honestly there's not much difference in conception. Bőhm in a concert setting was often more thrilling than in the studio, but this is hardly a work that lends itself to a wide spectrum of ideas. The Cologne players have both poise and elegance. They aren't the Berlin Philharmonic, but like so many of the great conductors, Bőhm coaxes the best sounds they can produce. The Stravinsky is evidence that Bőhm really did some of his best work outside the studio. Although hampered by early 1963 broadcast sound that pales in comparison to what Karajan was getting for his Beethoven from the same period, there's absolutely no question that – like on that YouTube video – Bőhm gets exactly what he wants. German radio orchestras in 1963 weren't exactly known for their catholic taste in repertoire, which makes this even more of a happy surprise. It's a tremendously exciting reading from a man whose Brahms and Schubert could be a touch on the heavy side. As the notes point out, he was a champion for modern music early in his career, much like Otto Klemperer, who was also pigeonholed into the "classics" later in his life. At any rate, Bőhm had supported the music of Stravinsky early on, and that commitment was obviously still strong in 1963. Despite a few minor issues here and there, fans of the conductor may find this the real reason to acquire this fine disc from Audite. All things considered, this is a most pleasant surprise.